We couldn’t be more excited to announce that Zenyatta delivered a filly by Medaglia d’Oro tonight at 8:50 pm. Both mare and filly are in excellent health. Check back soon for more photos of Zenyatta and her little girl. I was totally not expecting the wonderful news when I arrived at the computer lab this morning! Dearest Zenyatta I am crying tears of happiness and joy for you, Ann, Jerry and all the folks at Lane’s End that must love you as much as we all do. What a gorgeous filly. I kinda like Zenny d’Ora myself. The Moss’ are so great at names I’m sure whatever they choose will be perfect. My prayers for Mom and baby and I never forget her big brothers. What a blessing this blog is and what a wonderful FAMILY we have become. Love to all. Oh wow, finally some good news in my life that I care about! I’m in tears! I know everyone else in my world finds it stupid & ridiculous. But at least I respect their hobbies, even if they they can only turn left! So true Vicki. We are very lucky to have this site. So glad our baby girl is here! Waiting for more pictures! Such exciting news!! So happy for Z ‘African while family, two and four legged! Looks like she has Zenyatas ears!!! What a sweet girl!! Looking forward to more pictures! Hope they are both still well! Thanks! Same here. I’m a Nervous Nellie waiting for further news and/or pics. Same here. Big time praying for Zenny and foal!!! May you both stay safe and sound. I’m hoping they are just wanting their privacy and we will get a surprise post any day now. I agree. For all her other foals we got foal watch and lots of pics and videos right after the new one arrived. But the postings this year seem to be few and far between so I tend to think all is well — they just aren’t posting with frequency anymore. Congratulations to Team Zenyatta & Her Fans ! Pizazz is defined as a combination of vitality and glamour……a perfect name for a lovely little filly who needs lots of “Z”s in her name…..
Great news for our wonderful Zenyatta beautiful baby and mother. That little filly has the white star of children’s classic Sea Star. She is going to be loved. Congratulations Zenyatta!!!! She is simply ADORABLE!!! I am so happy for Zenyatta and team. Please provide more pictures and maybe a short video of them. Is Ann there? Beautiful…So happy for Zenyatta..She’s a Champ.. Yes. We always appreciate all that you do with keeping us informed, but we would love to see more pictures!! What an absolutely gorgeous little girl !! Do my eyes deceive me, or do I see a little curly mane ?? She is just precious !! Zenny looks so calm and happy–what a lovely photo. Will be eagerly awaiting the photos to come ! What a Mother’s Day gift for Ann–so glad she was back there for the race already. She must be over the moon. Peaceful,blessed night to mother and baby, and all who love them. Wonderful news! I think most of us were hoping for a girl and she is so sweet. Are they doing okay we haven’t heard anything and I am starting to get worried. I would love to call her Zenny. Another beautiful gift for Zenyatta. God Bless you both. No more news… Worry… No more news… We’re in this with you Zenyatta, good times and bad. We’ve had both following you. I pray for peace for you. Saw a quote from Jerry saying that he might not breed Zenyatta this year since this was such a late birth. Are Rachel and Song Bird little Princess De Oro’s aunties? 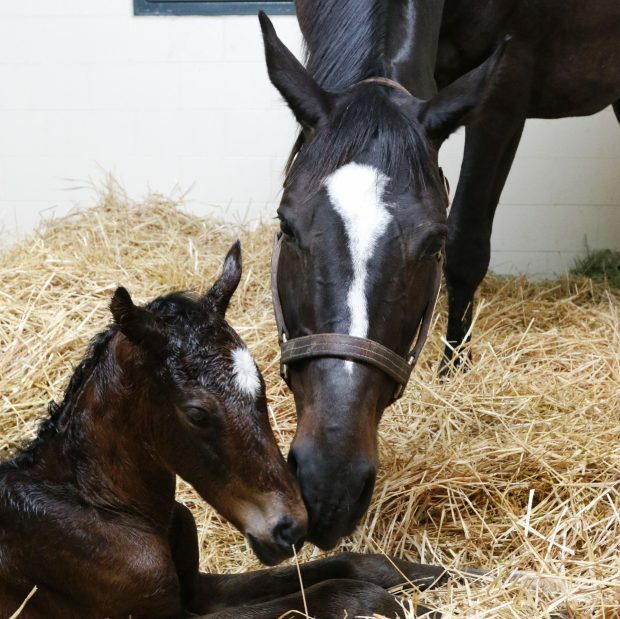 Dear Judy:We will have news soon I expect.Zenyatta must be just enjoying her new filly.